I have two young children. One of the values in which I am trying to instill is that of graciousness. A couple weeks ago I sat down with my daughter so that we could write thank you notes for the gifts she received for her third birthday. My five-year old sauntered by and made the comment that what we were doing was: “just plain silly because no one else ever writes thank you notes.” He got part of it right – very few people do write thank you notes. What he didn’t get right is the silly part. Taking the time to say thank you and show appreciation is not silly and is not passé. Rather, taking the time to say thank you is critical not only to your success, but also to your well-being. “Thank you;” two powerful words. Research published in the Journal of Personality and Social Psychology found that a mere “thank you” more than doubled the likelihood that those providing help would provide assistance again. The research also found that a ‘thank you” yielded an increase of 50 percent in terms of productivity and an increase of 15 percent in the average amount of time a person spent providing assistance. The researchers also noted a spill-over effect. That is, gratitude begets gratitude. Why is a simple “thank you” so powerful? The researchers found that expressions of gratitude increased feelings of both self-efficacy and social worth. They also found that it is the feeling of being socially valued more than the feeling of competence that encourages people to provide more help in the future. In short, people like being acknowledged and valued for our efforts. I offer up a challenge to you. 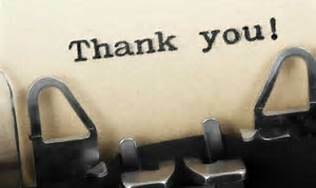 Over the next week take the time to say thank you, to acknowledge others, to praise, and to show your appreciation. My guess is that you will be both surprised and impressed by what and where two little words will get you – so much so that you’ll make thank you second nature.